The Lobotomist's Dream: Paper-Writing Cop-Out: A Pumpkin! While my life is currently being consumed by work at the moment (both of the school and RA variety), I don't think I should use my valuable work time writing anything significant. 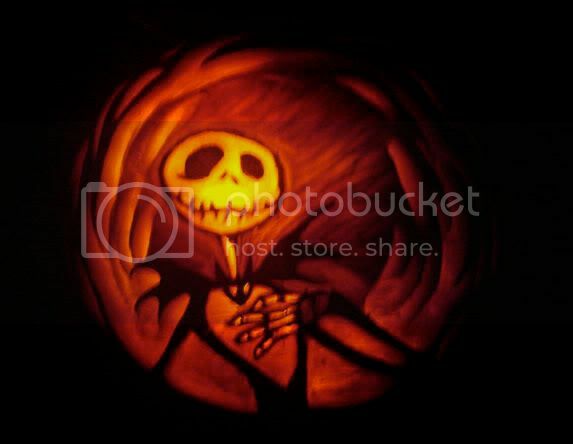 However, in order to show the fact that I do, indeed, remember that Halloween is coming up, I'd like to show what has to be one of the best-carved Pumpkins I've seen this year, and of a very popular character, Jack Skellington. Now I'm off to sleep enough to recharge my batteries for the day ahead. Toodles! Is that a real carved pumpkin, or just a computer generated image intended to deceive the simple minded and gullible?